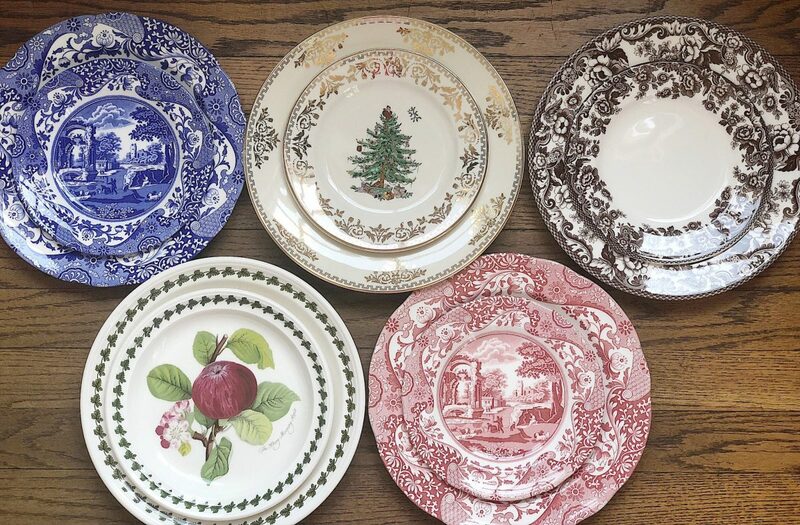 Spode Blue Italian, Spode Christmas Tree Gold Collection, Spode Delamere, Spode Cranberry Italian, and Portmeirion Pomona. Why are these my favorites? 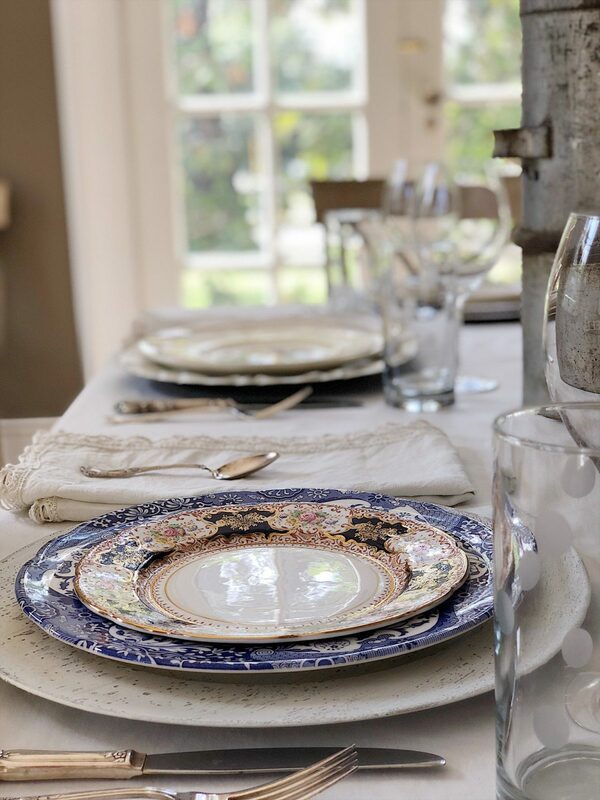 The Spode Blue Italian and Cranberry Italian plates are just amazing. They are versatile and can be used year round. 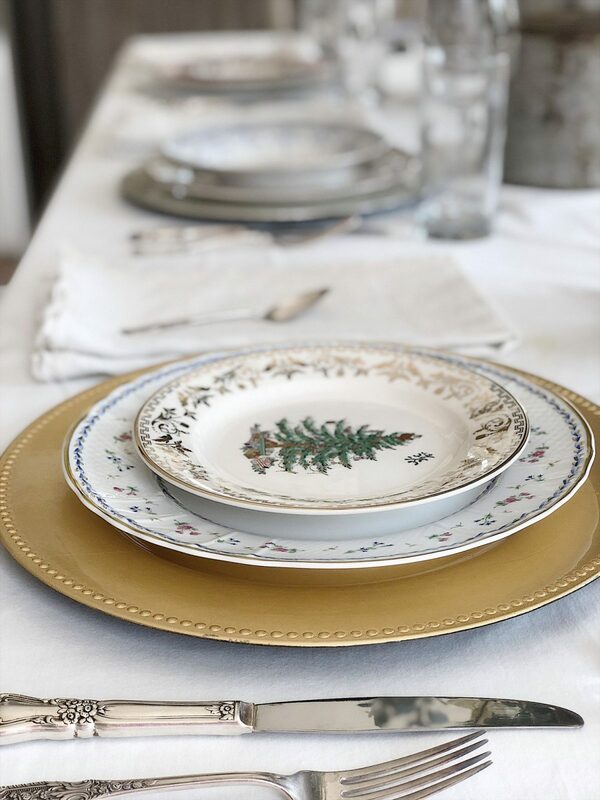 The Spode Christmas Tree Gold Collection is a slightly different version of the well-known Spode Christmas Tree and I am so in love with it! Spode Delamere is fabulous and I think you all know how much I love brown transferware. I have a feeling the Delamere will likely become one of my everyday sets of china by the end of this week. Portmeirion Pomona has been my everyday china for years. It’s hearty and fun and a great design! 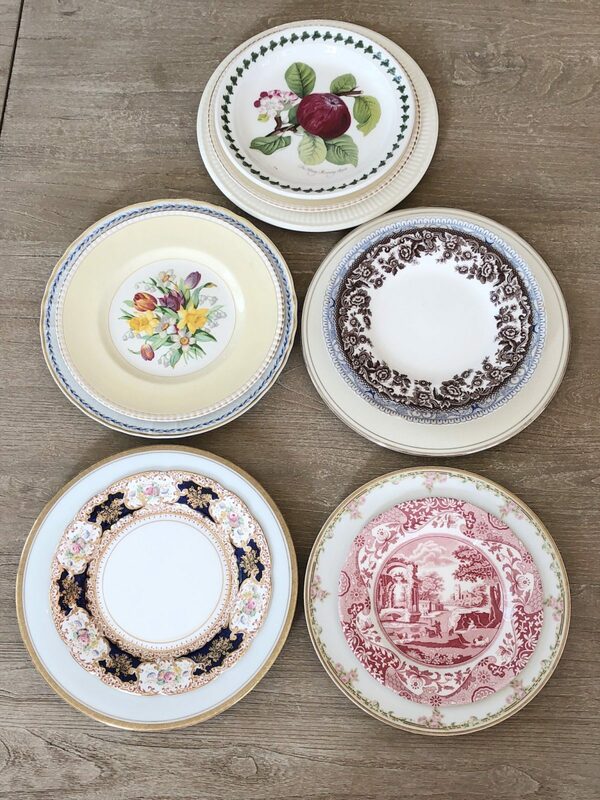 Here is the assortment of “grandmother’s china” that I was able to round up. I even reached out to a few of my girlfriends who gladly lent me a few plates as long as I promised to help them too! 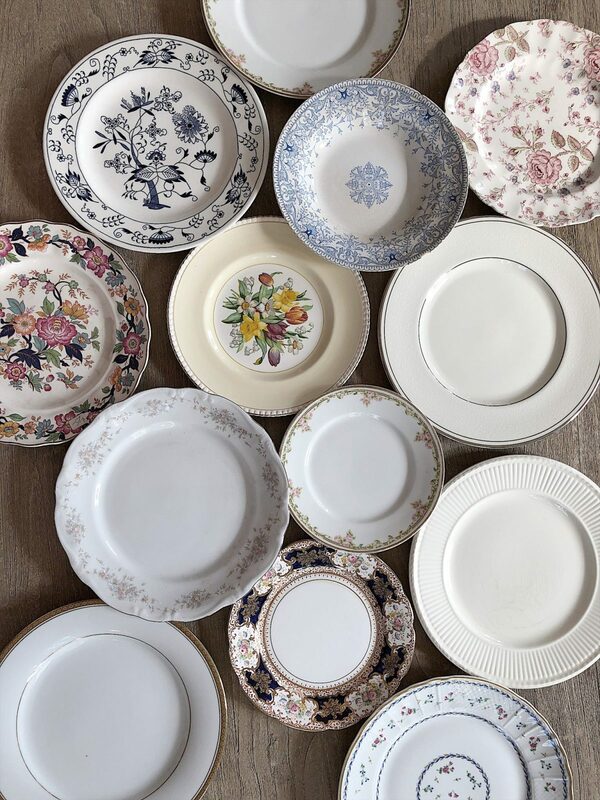 It’s a typical collection of the china patterns that might be hiding somewhere in your home. Let me show you how easy it is to update your china. 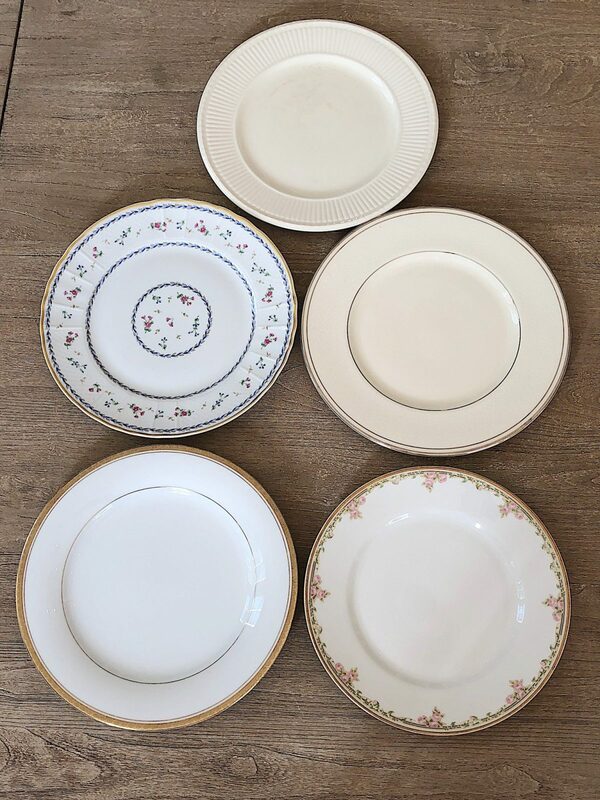 Here are five china plates I chose from my grandmother’s china collection. They are nice but need some sprucing up! I used salad plates from the Portmeirion Group and a few from my grandmother’s collection, and look at the difference! When you start mixing and matching, the possibilities are endless. It’s all about trial and error. I started with the dinner plates and tried all different kinds of combinations. I considered color, size, and design when making my decisions. It was a fun exercise because everything I tried worked! I tried it again but this time I used my Portmeirion and Spode as the dinner plates. It is amazing when you realize how easy it is to mix and match. 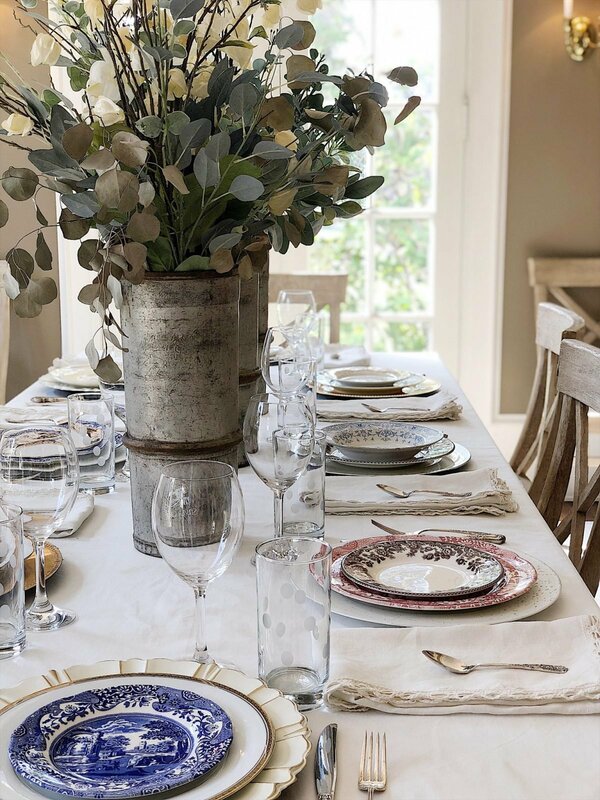 I love mixing blue and brown and this has inspired me so much that I have decided to set my entire Thanksgiving table in brown and blue! How great will that be? My next project was to set the entire table. 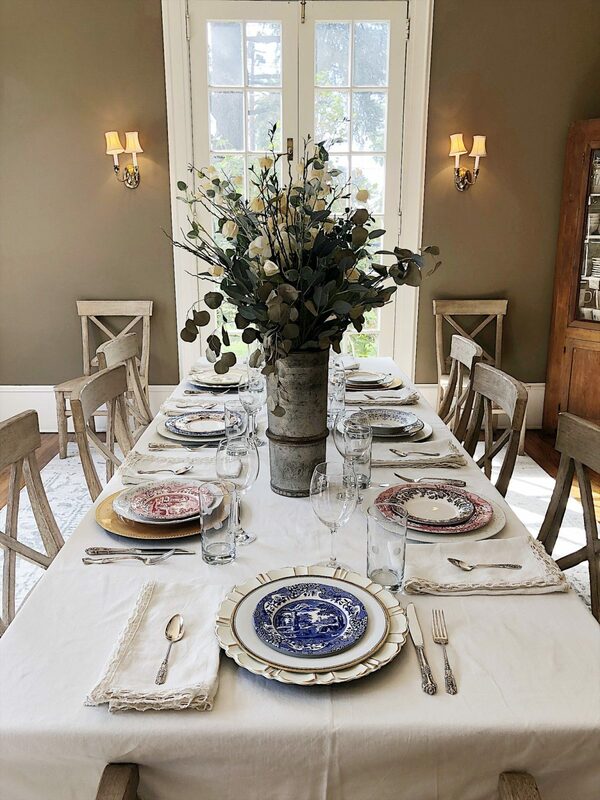 I chose four dinner and salad plates from my Portmeirion and Spode collection and my grandmother’s china collections. I also picked out four different sets of chargers. I set the table for a salad and a main course. When you mix and match you have to remember one thing. There are no rules. I just love this place setting with the Spode Christmas Tree Gold Collection set on top of my girlfriend’s china. 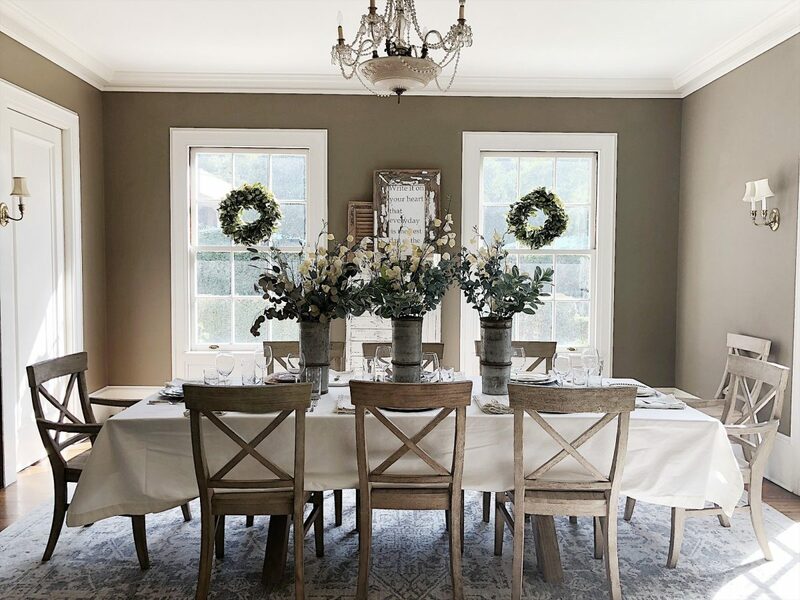 I can’t wait to set a table at Christmas like this! If you haven’t tried mixing china patterns you must give it a try! Look how stunning the Spode Blue Italian looks here. 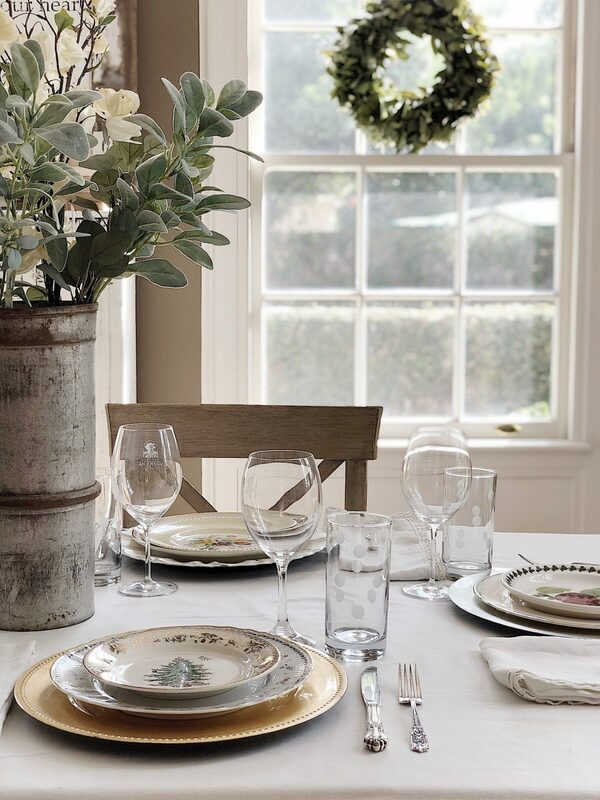 It’s time to dust off the boxes and find the family heirloom china. Don’t be afraid to use it. 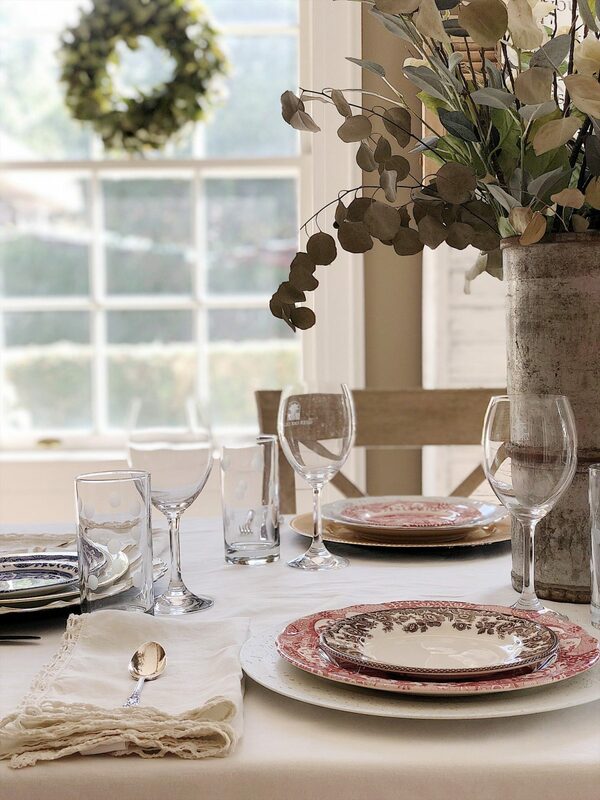 All you need to do is add some fun china like Portmeirion and Spode to get the look you want. There is even a chance you might use it sooner than the holidays! Love this! I enjoy all your posts! I love everything you love! I have a huge collections of blue and white plates and still collecting. Really enjoy all your posts!! I didn’t used to set either one of my tables (kitchen and formal)!! Well, thanks to you, I do now and I LOVE them both, even if its just the charger, napkin and dinner plate!! Tank you for being so inspiring always!!! I love all of the more modern sets but I am lucky in that I love my grandmother’s china! I found it boxed up after she had passed, I didn’t even know it existed, it had been boxed up that long! It’s a service for 12 that my grandparents received for their 30th wedding anniversary! This would be a great way to incorporate it with a pattern of my choosing on down the road! Over 45 years ago while on a vacation in Victoria Canada, we ate at a charming restaurant that used all different chairs and different place settings. 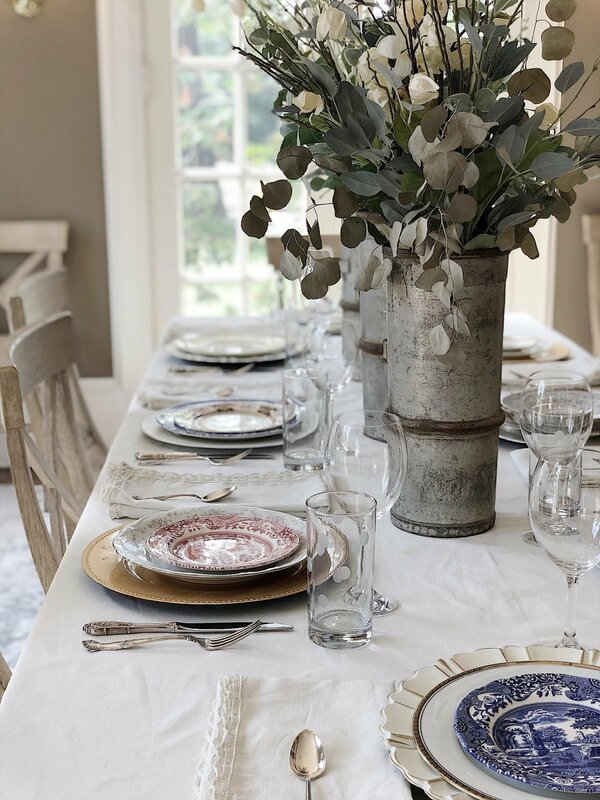 I have never forgotten that and thank you for reminding me of the possibilities of using the many sets of China I have collected over the years from estate sales. 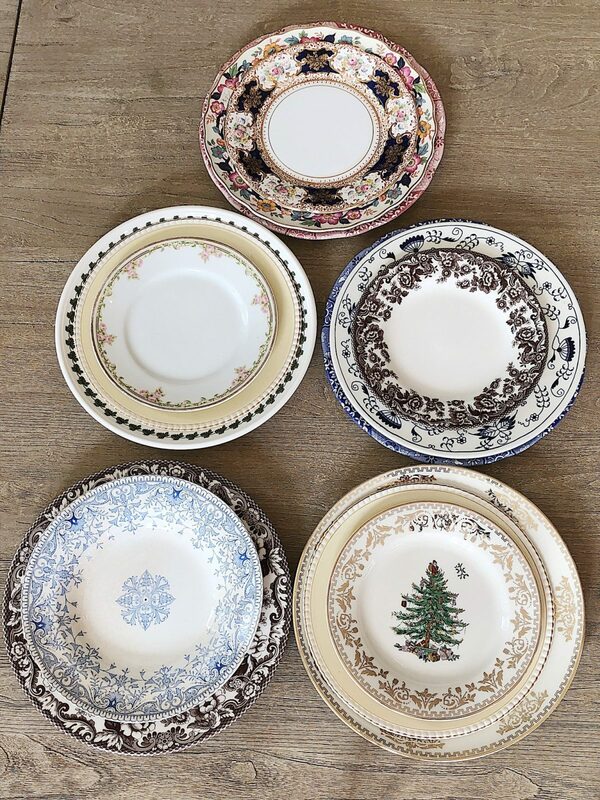 Just yesterday I picked up extra Christmas Spode dinner plates made in England for $2 a piece. After reading your article I’m excited to set a beautiful Christmas table this year. Have a blessed holiday and New Year.